I’m not usually a big reader of the crime genre, but I was delighted to receive a review copy of this one as it sounded a bit different. And luckily I thoroughly enjoyed it! Eve is a crime reporter but, you sense from the start, somewhat reluctantly. She gets sick at the sight of blood and isn’t nearly cynical enough to do the role justice. But with a sick father at home and a lack of funds, she finds herself stuck in a rut. I really enjoyed the glimpses into Eve’s stressful home life – it made her character seem very real and enabled the reader to sympathise with her. Her dad has dementia, and this was also portrayed very believably; my nan suffered with dementia and I found poor Duncan’s confusion completely believable – as well as the frustrations of Eve having to deal with him. Our glimpses into the life of the killer are also interesting as we slowly build up a bigger picture of him and what motivates him to act as he does. He is suitably weird and creepy and acts as the perfect foil to Eve. I think the other reason this novel works so well is that it manages to get just the right mix or gore and black humour. It never takes itself too seriously and this made it a really entertaining read and not just gruesome. Although the murders are pretty grim, there isn’t too much gratuitous detail, and this is well spaced out throughout the book so it never becomes a relentless gorefest. 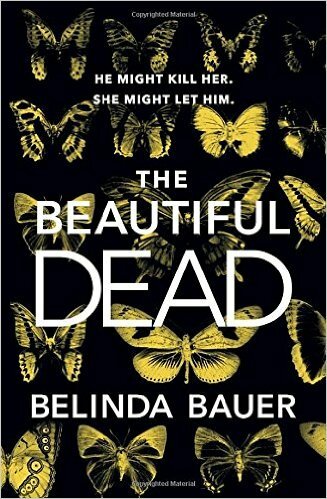 Some parts of the novel weren’t always entirely believable, and I could have done without the will-she-won’t-she romance subplot, but overall I thoroughly enjoyed this and would definitely read more from Bauer. I love the blend of gore and black humour with authors like Bauer. Thanks for this, will look forwarding to reading the book soon! Yes the mix really worked well! One of the reasons I enjoyed this book as much as I did was the humour. Hard to get the balance right while maintaining tension, but Belinda Bauers nailed it! I like that we get glimpses of their lives to be able to connect with the characters or understand them a bit better. I was definitely not expecting to see humor mentioned in the review, I’m intrigued 🙂 Great review!